Often the largest problem any business faces is wasted time, especially when it comes to the upkeep and breakdown of your printing devices. When your printer is working the way it should, then your business is able to run smoothly. But once that multi-purpose printer starts acting up, then you begin to lose valuable time as you or your employees try to fix the problem or you wait on the phone trying to get a hold of someone who can help. When it comes to office equipment and printers, managed print services can help ease the burden on you and your business. Whenever something goes wrong, you might turn to your IT department. And that’s a great way to run your business, especially when it comes to security and network issues. But the last thing your IT department wants is to be pulled away from important projects because they have to order ink or fix a major paper jam. 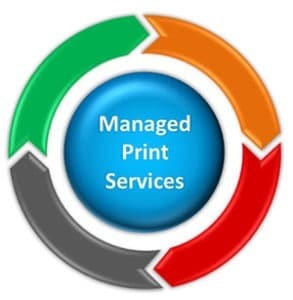 A print service company can help free up your IT department by stepping in to take care of those small issues that come up regularly in the office, including running out of toner and minor copy machine problems. develop an office plan that increases the productivity of your employees. Printers, scanners, copy machines, and fax machines can be a big investment for your business. But as you might know, the more you use them, the more wear and tear they receive. One way to make sure that your office equipment lasts is investing in routine maintenance services. As well as solving any malfunction, an MPS can make sure that all of your office equipment is running smoothly. And once a device quits for good, they can recommend the best replacement and recycle the old device for you. An MPS can also help streamline your business by reducing the number of vendors that you have to work with. If you been buying your toner from one company, contracting maintenance from another, and buying new equipment from yet another, then you might not know who to even turn. An MPS is an all-in-one service who can be your one-call for all of your needs.